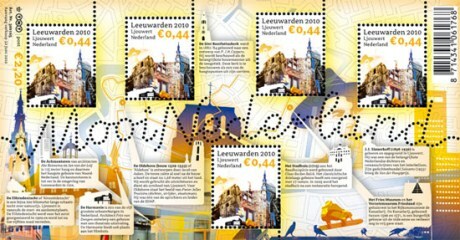 On June 22, 2010, Leeuwarden, the capital of the province of Friesland, was issued its own postage stamp in the series Beautiful Netherlands 2010 by TNT Post. On the same day, a collector sheet with all five cities selected for 2010 Beautiful series was also issued. Beautiful Netherlands (Mooi Nederland) has a multi-year series that began in 2005. The five stamps on Beautiful Netherlands Leeuwarden are the facades of some attractions: the Oldehove, the Chancellery, the tower of St. Boniface Church and the Achmea Tower, with the foreground and the Harmony gold skating – a reference to the Elfstedentocht.